The Base Matte that is specified in this tutorial, is now no longer needed. The colors are already matt. Welcome to the Little Dreams Collection Painting Tutorial! “They Never Grow Up Nursery”. It is my pleasure to bring this tutorial to fellow artists. I am an experienced reborn artist and am skilled in the use of Genesis Heat Set Paints and now have been using the LDC® paints since February of 2008. I would like to share what I have learned about the character and usability of the LDC® paints. You, the reader, benefit from my trial and error! Keep in mind that this is the way that I paint and it does not necessarily reflect the way that other artists will paint. I am counting on each one of you to open up your creative energy and experiment for yourselves the beauty of these water based, acrylic paints that are made especially for vinyl doll kits. Have fun creating beautiful, long lasting heirloom dolls! Before I begin this tutorial I must express my appreciation to my two exceptionally wonderful friends who helped me in the production of this project. Sally, thank you for standing at my beck and call for three days taking the pictures as I painted. Kathy, thank you for translating my spoken voice into text for use on this website. You two are two-thirds of this project, I would not have wanted to do this without you and I am forever grateful! I have chosen the beautiful Little Dreams Collection “Robin” kit sculpted by Adrie Stoete Schuiteman for this tutorial. I love the neutral creamy color on this kit as it forms a wonderful canvas for all artists. Don’t let this picture fool you, we are not ready to paint yet! 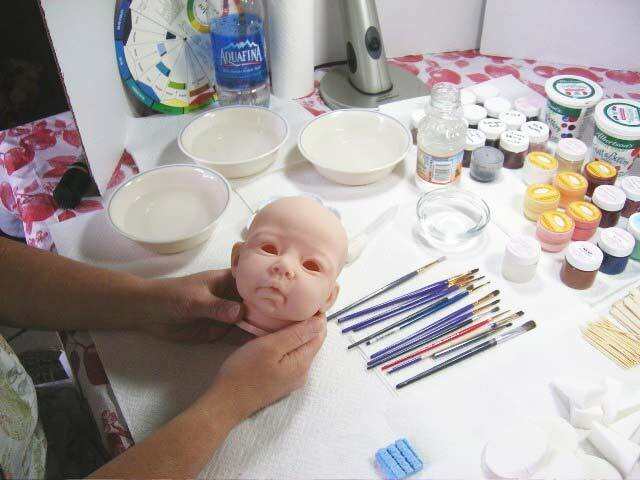 One of the most important steps to painting with ANY paints is the preparation of the doll kit. If you have chosen to open the nostrils and cut the eye sockets (where applicable) now is the time to do that. I will be using a cordless Dremel tool (the cordless model is recommended as it runs slower than the corded tool and gives you more control of the drilling, helping to reduce the risk of damage to the nostril and upper lip), a small hemostat, a round file, a fine point tweezer, and an exacto knife. I like to open the nostrils of all my dolls. It really is not as nerve wracking as it sounds. 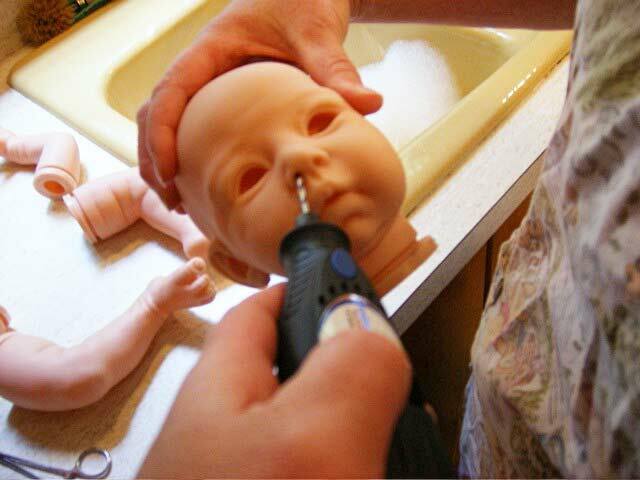 Using a cordless Dremel tool, choose a drill bit that is about the same size as the dolls nostrils. Run the drill on slow speed at an angle that is the natural angle of the nostril…usually up slightly and toward the opposite eye area. Poke a round file inside the nose to push the “nose booger” (AKA a small piece of vinyl that stays attached to the inside of the nostril) and grab the “booger” with the small hemostats or the tweezers. Now use the round file to smooth any rough edges inside the nostril. This is an open-eyed baby so I am going to open up the eye sockets. A lot of people like to put the eyes in from the front, but I prefer to do it from the inside. Use an exacto knife for this procedure. Reach in and slit open the socket from one corner to the other at the bottom of the socket. Move slowly so that you do not cut the vinyl on the outside doll. Watch your fingers as well. 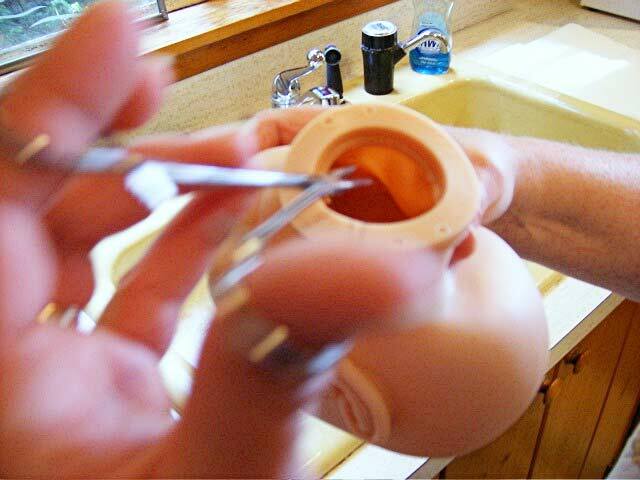 Leave the top attached to help hold the eyes in place when the eyes are glued in later. Now it’s time for a bath! This is the most important preparation step before painting. Fill a basin with hot water and dish soap. 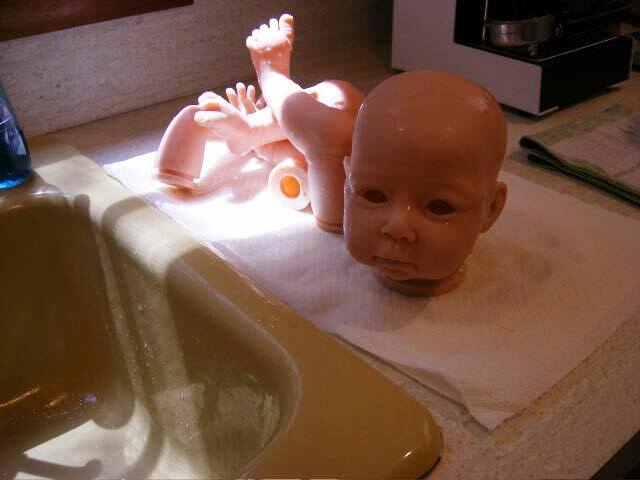 I use Dawn dish soap because I think it helps cut the manufacturers residue off of the doll kit. Place all your vinyl pieces into the basin at once. 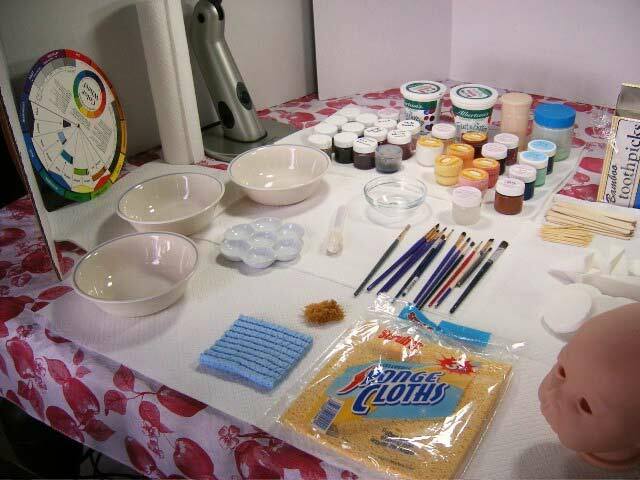 Using a sponge wash the doll kit to remove anything that the manufacturer may have left on, paying close attention to all of the creases in the vinyl such as the ear creases, the nostril creases, the mouth , behind the knees and between all the fingers and toes. Using a small toothbrush is helpful in doing this. Sometimes the kits will have little black spots on them when they come from the manufacturer. Most times you can get those off, if you can’t, don’t worry it will probably be covered up within the painting process. You can make those spots look like birth marks or moles if you cannot get them off. Rinse all of the vinyl pieces well in clear, hot water. If you are in doubt of any residue left on the kit, use a toothbrush in the rinse cycle or rewash in the soap bath. Set the pieces on a clean white cloth or paper towels. Tip them upside down, let some of the water drain out and then dry them with a lint free cloth. 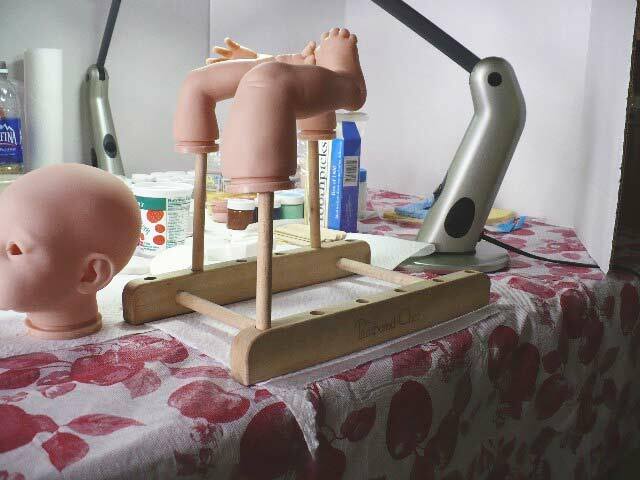 Typically, I prep my dolls the day before I begin to paint, that way the water has time to drip out of the limbs and eye sockets. While the insides of the pieces are draining and drying, we can set up the painting table. You will need some bowls of water during the painting process. 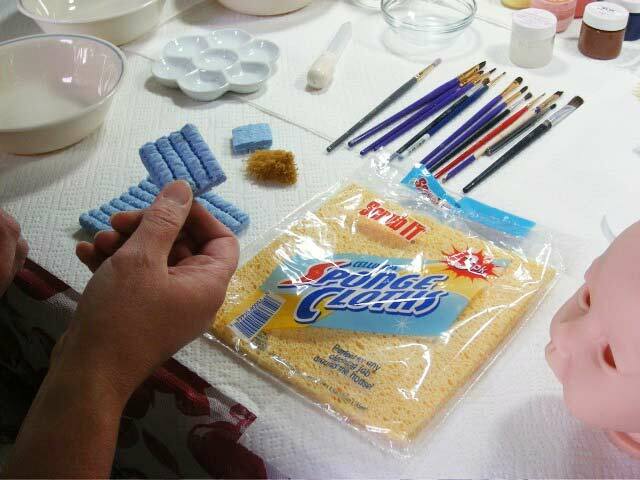 I use cold water in a small dish to wet my sponges for the application of paint. I also fill up three larger bowls of warm to hot water. These are used for rinsing out my paintbrushes as I work and also for rinsing off my fingers if I get too much paint built up on my fingers. I like warm water for rinsing the brushes, cold water for working with the paints because we do not want to promote the paints to dry too quickly and the heat may cause them to do that. I keep a small bottle of cold water nearby that does not come into contact with the paints. This bottle of clean water is used to add water to the paints as we blend and work with them. Having a drying rack is useful while painting. I use a Pampered Chef stoneware drying rack…it works great! I apply most of my paints with various kitchen sponges and pounce them in with make up sponges or wedges. I do not use cotton make up rounds/squares as they are too fuzzy and soak up too much paint. Be creative when choosing your kitchen sponges to create different textures. Take a good stroll down the kitchen sponge isle during you next shopping trip. You will be amazed at how inspired you become! One of my favorite sponges is one that has has squarish “bumps” on one side. I usually use it for the first two layers of paint that I apply. Selection of paint brushes is important too. You do not need to buy expensive brushes, just brushes that serve the purpose and are comforatable to you. Paintbrushes are excellent for blending. I like to keep 2 paintbrushes that are the same size and have a stiff bristle. I keep one ready to get wet in case I get too much paint on the doll and it dries a little quick and makes a line or blob. Just get that paintbrush wet and blend the paint back in and then go over it with a damp sponge/wedge. The dry brush is used for blending if the paint has not dried too much. I use a variety of other brushes as my creativity sees fit. LDC® paints, LDC® Retarder, LDC® Matte Base, white paper towels, various paint brushes, various kitchen sponges, a natural and regular sea sponge, scissors, make up sponges and wedges, eye dropper, several bowls for water, popsicle sticks, toothpicks, color wheel, apron, powder free and latex free vinyl glove (found at Walmart in the pharmacy) and a drying rack. Another artist emailed me and said that she likes to use puppy training pads to cover her work area instead of paper towels. I like that idea very much! * Do buy the full trial set of paints! I have chosen 10 of the 14 paints as my favorite but I would hate to have one of you buy just what I like and miss out on fabulous details and color that you create using those other 4 colors. By the time you are ready to order the full ounce size jars, you will know which colors are your favorite. 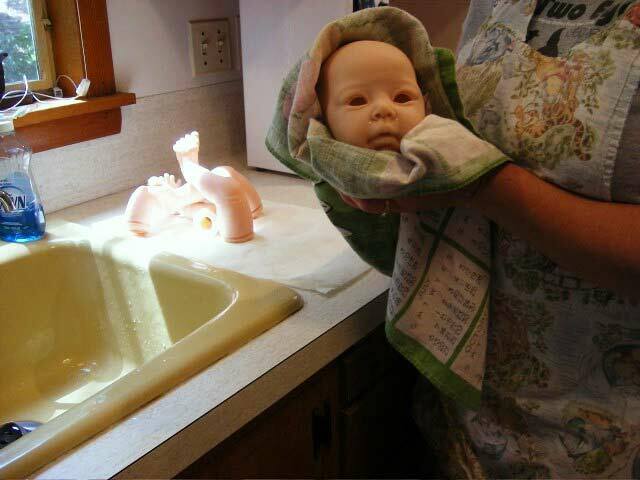 * Do wear a latex and powder free glove on the hand that you will be handling the doll parts with. Oil from your hand will accumulate on the doll vinyl causing the paints not to stick…this is true of all paints, not just the LDC® paints. As you see, I am not wearing a glove in these pictures….this is how I found out about this problem and I recall other dolls that I painted in the past that I had this same problem where the paint did not want to stick. It was a DUH moment for this artist! But, I was able to wash the parts where the oil from my hand affected the vinyl (mostly on the high points of the vinyl limbs such as the fat rolls) with alcohol and successfully repainted them. The alcohol did not affect or remove any of the paint in the surrounding area, it only removed the oil that hindered. * Do stir the paints on the pallet frequently as the water and the paint will begin to separate. Keep them stirred. * Do allow the paints to “cure” on the vinyl for 24 hours before rooting hair or assembling. Even though they are dry to the touch almost instantly after painting, they do need time to really set in and cure. * Do have a damp make up wedge or sponge handy while you are painting. It is useful for quickly removing just applied paint. If the paint is not the right color, applied too thick or your painting sponge or brush has left a line, you can remove it now if you hurry. This is the ONLY time that you will be able to remove these paints with water. * Don’t leave your paints uncovered. They dry very quickly. Put the lid on the jars of LDC® paints after use and store mixed paint in small jars and stir well before using again. 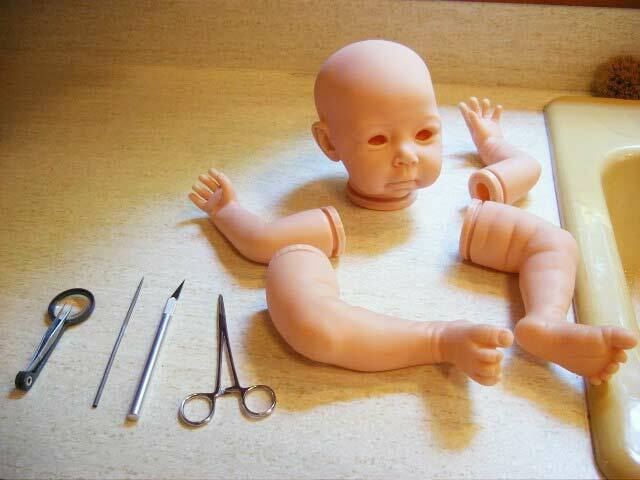 * Don’t cure your doll parts in front of a fan. The air is too cool and they won’t cure. * DON’T use heat to dry or cure your paints. The LDC® paints turn orange before they are cured when exposed to heat. I was worried about what might happen if a painted doll was left in a hot summer car after it was cured. I tested this out….the cured doll was just as beautiful after days in the summer heat as it was when it went in. It did not turn orange and neither did the LDC® paints that were in closed jars in the car as well. * No need to bake your dolls. When you bake vinyl, you risk melting it loosing all of your hard work. The baking process also hardens the vinyl and can accelerate the aging process of the vinyl doll. * The paints dry fast allowing the continuous building of layers in the same painting session. * The paints are fume free. * The paints are matte in their finish eliminating the time consuming layering of a matte varnish. * The paints are silky smooth to the touch when dry on the vinyl. * The paints will not fade nor wear off. They are permanent after the proper curing time when all your painting is done, which is 24-48 hours in the summer and 7 days in the winter.